Connectors in Bizagi are portable modules that allow you to extend the functionality in terms of integrating to another systems or application, as described at Bizagi Connectors. This section illustrates how to manually install a connector in your Bizagi project. 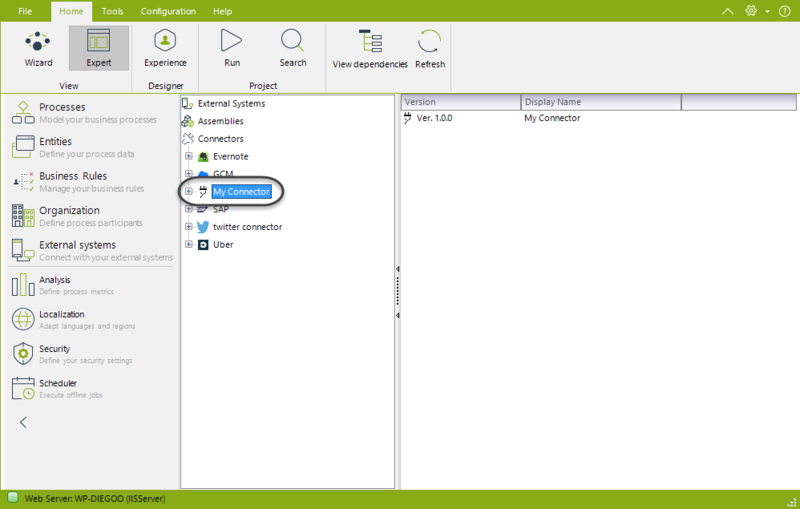 Recall that automatic installation of a connector can be done by opening the Connector Xchange from Bizagi Studio. For more information about automatic installation, refer to Connector Xchange. 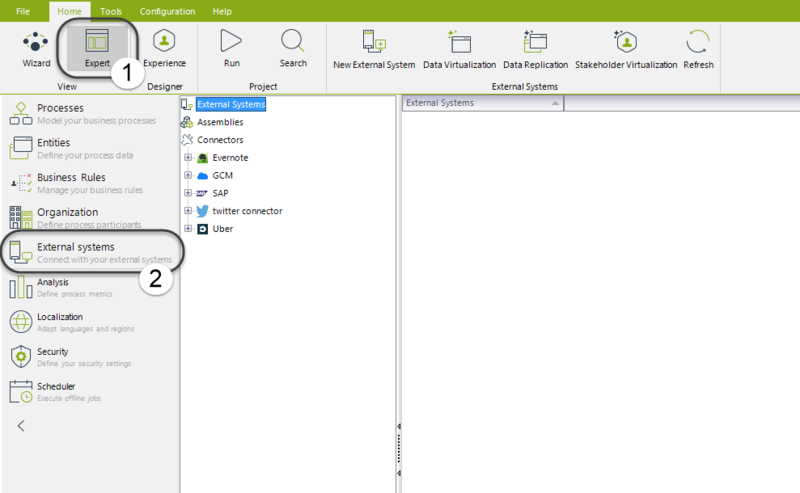 To install and set up basic configuration for your connectors, make sure you already have downloaded a connector from Connector Xchange, or have created one by using the Connector Editor. This means that at this point, it is required that you have a valid .bizc connector file in a local folder of your computer. For more information about the latter option, refer to Creating Connectors. 1.Open the Expert view from the ribbon and select External Systems. 2.Select Connectors and click on Add connector from option located at the Ribbon (alternatively, this can be done by right-clicking Connectors and choosing that option as well). 3. 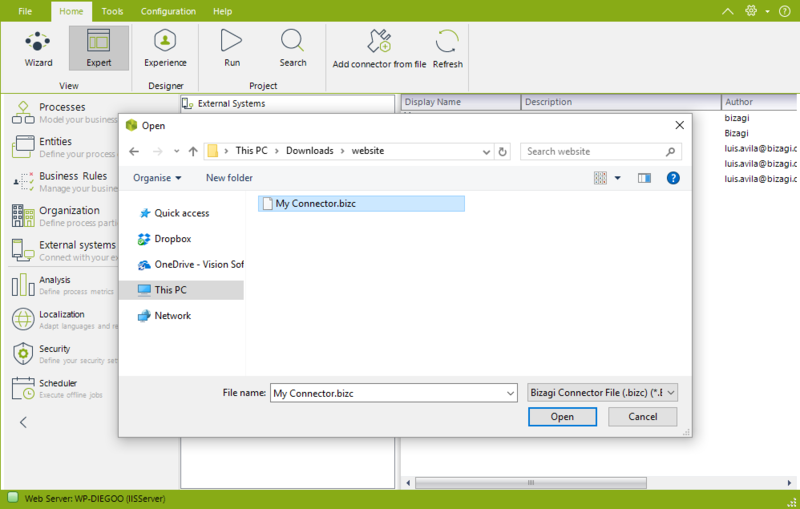 Locate your .bizc connector file on your local computer and upload it. 4. 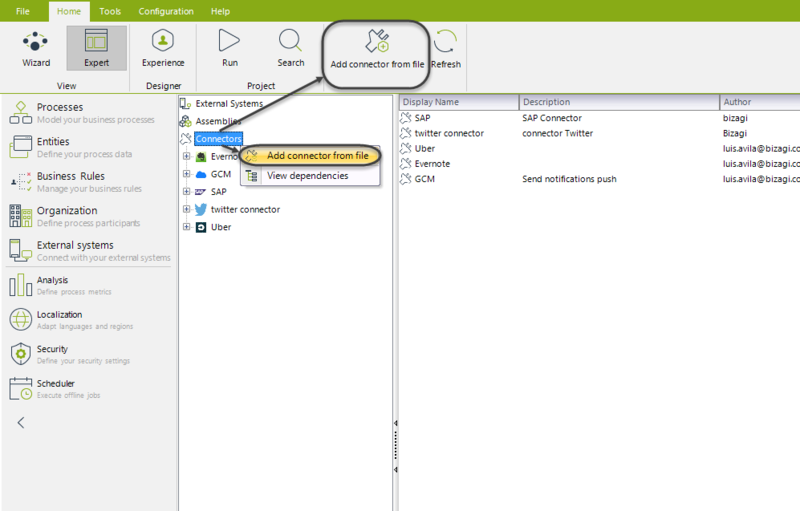 Once your connector has been uploaded, it will be listed under Connectors with its corresponding icon and given name (as defined during its creation in the Connector Editor). In the right frame, a list with all versions of this connector will be shown: the first time you upload a connector, the list will show only one version (1.x.x). On the other hand, if this is not the first time you upload a connector with a same name and different major version, the list will show more than one version. If you are installing a modified instance (a major version) of an existing connector, then it will be listed as a new version ( 2.x.x, 3.x.x,...). Otherwise, will just replace the same version installed (it is strongly suggested to be fully aware of how versioning works for connectors in order to avoid overwriting them when not intending to). To learn more about multiple versions in connectors, refer to Connectors versioning. 1. 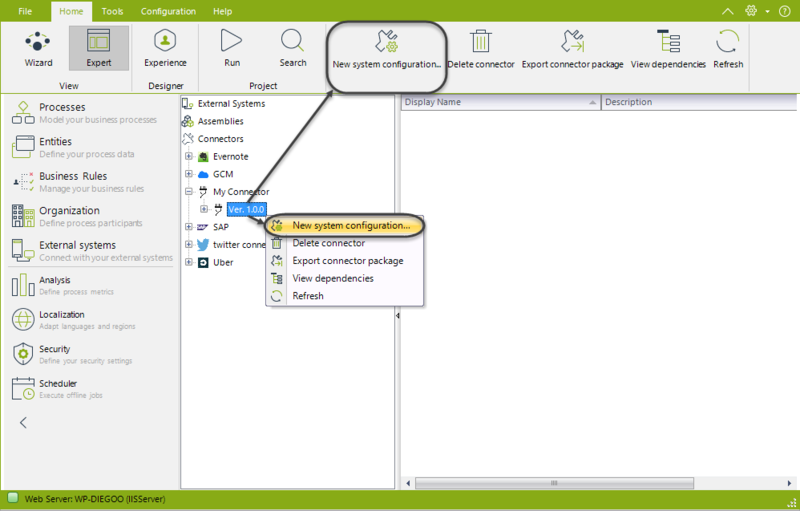 Create a new configuration instance by selecting the version of you connector and click on New system configuration. 2. A new window will be displayed prompting for basic details of your connector's configuration. Enter details as described in the table below. Notice that most of these fields you need to enter, are tightly bound to parameters as defined during the creation of the connector (i.e when specifying the properties or authentication parameters in the Connector Editor). Description given to a particular connector version configuration. Icon given to the connector when created or edited in the Connector Editor. It is not necessary to specify all the environments information the first time, can be updated when necessary. Parameters used by the connector. 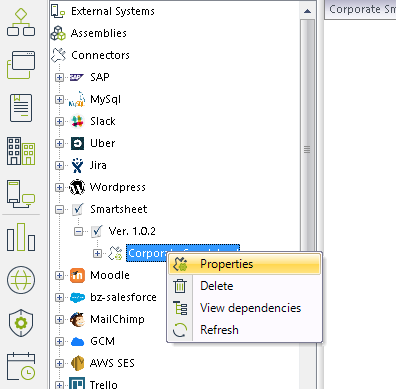 When using Assisted REST Connectors, this list will be empty by default. This parameters are send in the header of the REST message. Name of the predefined connector's parameter. This name is assigned when creating the connector in the Connector editor and can not be changed here. When required, an asterisk character will appear before the Name of said parameter. Value of the connector's parameter. This information has to be fixed (not dynamic) and can not be changed during a workflow. Parameters used by the connector to successfully authenticate, as usually demanded to execute actions in an external system. These parameters are defined when creating the connector from the Connector editor and can not be changed here. Learn about the workings and considerations for authentication methods at How authentication works in Connectors. Name of the predefined authentication parameter. Value of the authentication parameter. This information has to be fixed (not dynamic) and can not be changed during a workflow. A link to this online documentation. •Pressing OK will save changes. •Pressing Cancel will discard changes. 3. 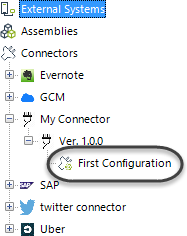 Once configuration is saved, a new configuration item will be listed for that version of your connector. At this point your connector has been installed and it is ready to be used in any process of your Bizagi project. For information about how to use the connector, refer to Using Connectors. At any time, you may right-click a configuration instance of a specific version of connector in order to edit its parameters by selecting properties. Similarly, you may select delete if such configuration is not being used by your processes.